LG G4 is a successful Android Smartphone of LG Electronics. It is packed with great features like a big screen, great resolution, better camera result, super fast speed, excellent battery timing and nice and beautiful look. Having all the requirements root access is the must for the full use of Android Smartphone. Here we will guide you how to Root LG G4 all models. The process of rooting is very easy. No need to unlock your smartphone’s bootloader or install any custom recovery. We can say this is the easiest way ever for rooting LG G4. If you are an Android geek and want to full control over your device then you must need to root your smartphone. Rooting an Android means giving yourself root of super user access. It gives users access to system files and ability to change things akkadikoy.com according to your choice. Rooting removes all the internal restrictions of software and all of its subsystems. That’s why Android OS is famous all over the world due to its customization according to our choice. There are many benefits of rooting like you can overclock phone’s CPU, install custom Recovery, enjoy Custom ROMs and install every type of third party apps. We will use One Click Root process for rooting our LG G4. It is an easy process and the good thing is that this is not a data loss process. You can root your device without losing anything from your smartphone. Read the instructions carefully and root your device according to saying. Charge your phone 50% before rooting to avoid power issues of the device. Have proper working USB Data cable. 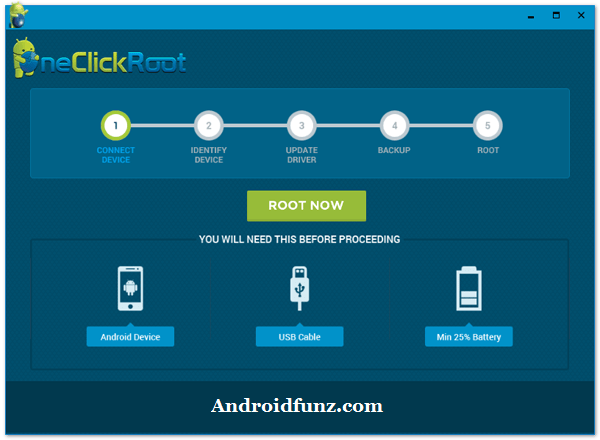 Download and install One Click Root from the above link. Enable USB debugging of your LG G4. For this go to mobile’s Setting>>General>>Developers Options, from there, enable USB Debugging. (If don’t find developer option then go to Setting>>About Phone>>Software Info, now from there seven times on Build No, this will show Developer Option, now enable USB Debugging mode. Connect your device to PC with the help of USB data cable, wait until LG G4 drivers will install automatically on PC. On PC Run the One Click Root App. The rooting process will start automatically. It will take some time. After completion, your LG G4 will automatically Reboot. That’s mean you have successfully rooted your LG G4. Now you have controlled over your device, you are free from all the restrictions of the manufacturer. Fully enjoy the Great LG G4. If you have any issue during the process let us tell in comments. Androidfunz.com will pleasure to guide you. Thanks. I also used the One Click Root tool and it is very effective. It rooted my phone and I highly recommended this tool.